Work faster and get morecreative control than ever before withprofessional hardware control panels! Incorporating node-based image processing, the DaVinci Resolve provides color correction, power windows, and effects for nodes that offer a powerful color correction medium as compared to layers. Faster workflows in real-time are offered via the Resolve control surface. You are also provided with 32-bit floating point and YRGB image processing allowing you the highest depths in color correction. The Resolve control surface incorporates a slide-out keyboard that is useful when naming or renaming files, and can be neatly tucked away when not in use. All functions are accessible via separate keys such as reference keys and the fader T-bar that allows you to wipe between reference stills. You can easily control the image sections via keys that are located for easy access along your natural hand positions. Lift, Gamma, and Gain adjustments along with RGB control is achieved via trackballs. Menus and indicators are visible via 5 high-resolution LCD displays that offer a view of functions of 62 knobs and buttons. Soft knobs that can precisely control parameters via single touch are provided, and no electrical contact eliminates wear out of the knobs. Aesthetically illuminated keys are backlit using RGB color and intensity. Complete control of project timeline or deck is offered via the jog/shuttle knob and transport controls. The DaVinci Resolve Control Surface panels feature workflow ergonomics and ease of use so Colorists can quickly and accurately construct simple or complex creative grades. The panels feature highresolution liquid crystal displays (LCD) and backlit hard keys to accommodate a darkened grading environment. The color and intensity of the keys and the LCD panel brightness are user programmable so each Colorist can set up his/her personal panel configuration. There are three panels in the control panel set. The center panel is the Trackball panel. The majority of controls and feedback for the Colorist is found on this panel, including a slide-out keyboard. On either side of the Trackball panel are two interchangeable panels, the position of which is determined by operator preference. The T-bar panel, shown above on the left, has a T-bar mix/wipe control and a number of menu and function keys. The Transport panel, shown above on the right, has the timeline transport controls and a jog/shuttle control as well as a numerical keypad and associated function keys. All panels have soft keys and variable control pots within the LCD panel, which provide an accurate visual reference to the control without the risk of parallax errors. Given that so many of the controls are menu based, this User Manual will describe each of the hard keys and controls and then, separately, the menu structure and controls of the soft keys and variable pots. A key feature of the panel design is the feedback given to the Colorist. The LCD panels provide a color and value indication based on the last control adjusted. The hard keys also reflect the last button pushed and, in some cases, other keys on the panel are illuminated or dimmed based on the menu options available for the operational mode selected. The Blackmagic Design BMD-DV/RES/AADPNLDaVinci Resolve Advanced Panel is perfect for dedicated color correction suites and grading theaters where professional colorists work all day. 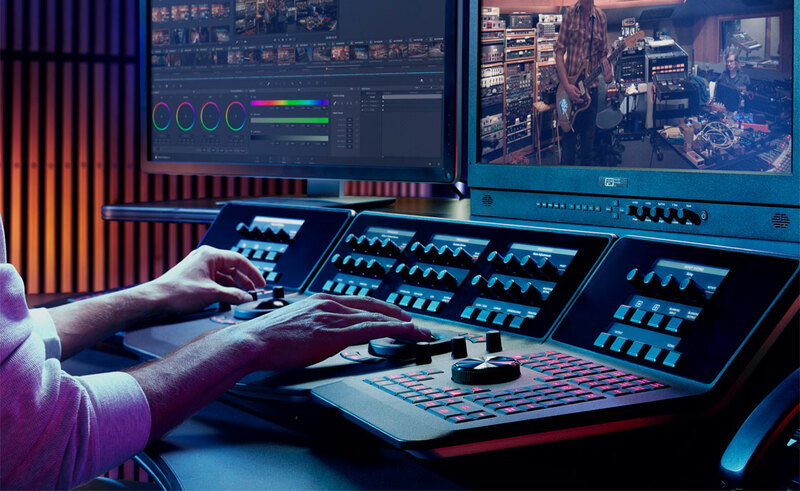 It's the ultimate in speed, power and control and has been designed with three ergonomically connected control surfaces and a pull out keyboard; the Advanced panel gives you complete command of every color grading session! Each correction control has a separate soft key, knob, high resolution weighted trackball or ring so you can experiment quicker to create a wider range of looks. Computer based solutions are always limited to the computer you're running on. DaVinci Resolve when running on Linux smashes this limitation, because it's based on a cluster of Linux computers with high performance GPU cards, so all processing is always real time. This means DaVinci Resolve Linux has all the power of a super computer for the real time performance you need when you're in a room full of clients. Add dozens of primaries, secondaries, power windows, multi point tracking, blurs, and more, then just hit play. It always works! Start with a single computer on Mac OS X for lower cost, then upgrade to Linux for extra power for high resolutions such as 2K or 4K, stereoscopic 3D feature films, or real time grading of raw RED files. It's all possible with DaVinci because you can just add extra Linux computers and GPU cards via high speed InfiniBand connections. Only DaVinci Resolve scales up as your needs increase. DaVinci processing quality is so revolutionary it won an Emmy award for contributions to the television industry! All image processing is handled in the deepest 32 bit floating point accuracy, so even if you wind down one layer to almost black, you can still wind the following layer back up with no loss of quality. All effects, power windows, tracking, primaries and secondaries all operate at the highest bit depths, even when processing in real time. That's the engineering perfection clients demand. High quality control panel look and finish. 100+ hot keys for immediate and responsive feature selection. Provides creative grading control with instant user feedback. Optical precision super smooth Lift, Gamma and Gain trackballs. Five high resolution LCD screens with soft menus. 30 soft keys for fast and seamless menu control. 32 soft knobs with display for concurrent multiple trims of grades. Direct control of ARRI and RED camera decoder settings. Direct six vector curve and RGB mixer controls. Full transport controls including Jog and Shuttle knob. T-Bar for wipe control for still to grade comparison. Customizable panel display and key brightness settings saved per project. Customizable panel key color settings saved per project. Trackball and knob sensitivity settings saved per project. Fourth trackball for Offest, cursor and window positioning. Direct key selection of memories. One key to grab stills. One key to play stills. Powerful shift up and shift down qualifier keys. Separate left and right panel permits position to user preference. DaVinci Resolve Control Surface connects by simple USB 2 cable. Supports USB 2 extenders. Knob positions for custom curves and YSFX have been remapped. Shift Down + Play Still will display the node graph of the wiped reference still or timeline clip. Shift Up + Play Still will apply the grade from the wiped reference still or timeline clip. The Advanced Control panel includes controls for the Sat-Sat curve.